THE Small Faces were only together for four years but in that short time they created one of the most impressive back catalogues in pop – Itchycoo Park, Tin Soldier, Watcha Gonna Do About It, Lazy Sunday Afternoon and more. They also influenced a host of bands from the Jam (even Paul Weller’s hair!) and Oasis to Blur, Ocean Colour Scene and Arctic Monkeys. That’s the reason a musical about late frontman Steve Marriott and the rest of the London band has become such a successful stage musical; All Or Nothing. “Without trying to sound boastful, I think The Small Faces were the complete package,” says Mollie Marriott, Steve’s daughter who advised the makers of the show. “Not only did they play great music but they made such a fashion statement, their mod image was very real. “My dad was obsessed with fashion – unfortunately, something he’s passed on to me! All Or Nothing has completed a long run at the Vaults in Waterloo and is now heading out on a UK tour, so the cast are well practised. “The band just nail it,” says Mollie. “I’ve been the vocal coach as well as the creative consultant and I’ve worked very closely with Mark Newnham who plays the younger Steve. When I first heard his voice I it was very echo-like and nasal and I said ‘Who’s your favourite band? And he said Radiohead, so I knew straight away why he was pitching his voice like that. It tells the true story of The Small Faces from their East End beginnings to fame and fortune but, along the way, they discover that the music business is full of exploitation, corruption and betrayal. “They were only together for four years but made such a big impact on so many people,” says Mollie. “As well as the band, there’s an older version of my dad; it’s his spirit played by Chris Simmons. He narrates it and he’s looking back over his life with the band. “It’s quite a beautiful thing because towards the end he admits that it was his fault that the group disbanded. “I know it’s what my dad wished he could say. I was only six when he died but his views are very well known. He felt terrible and it was something he wished he hadn’t done, but at the time it was how he felt and he wanted to play more blues and R&B. 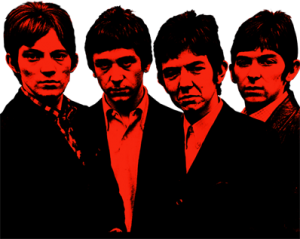 “He felt that The Small Faces had become very manufactured and packaged and he didn’t want that. As for the man himself, Steve died in 1991, but Mollie says: “I remember him playing the piano at home, and something many people don’t realise is that he loved opera. My mum loved music too so there would always be music in the house. All Or Nothing will be at G Live in Guildford from Monday (27 June) until Wednesday (29 June).